Want to advertise your business? Accent a panel or trip piece? Wrap the whole car? We do that! By using only high quality materials from the biggest and best companies in the game, 3M, Hexis and Oracal, anything is possible! From full colour change and accent pieces or panels to full colour vehicle graphics and advertising. finishes can be gloss, matte, metallic, matte metallic, carbon fiber, textured leather and animal skin, brushed metals, chrome, "chameleon" colour shifting films and more! we can mix and match textures and colours in any combination to fulfill anything you can dream up. Want to know more? Contact us for more info and pricing. 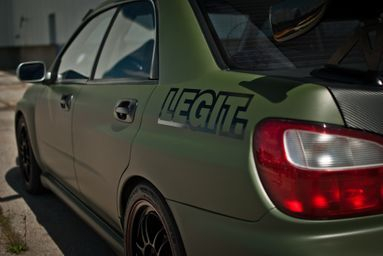 Add a custom look to your ride by wraping your roof, hood, trunk, spoiler, or any panel in any of the vinyl finishes we offer, from gloss black to alligator skin and anything in between. 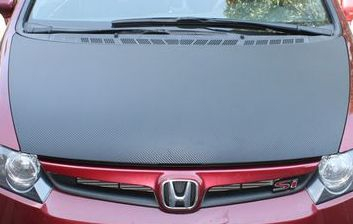 Every panel is different and therefore prices range from $150 and up, depending on material cost, size and difficulty of wrap. Contact us for exact pricing and to discuss design options. Printed on special perforated vinyl and laminated with a optically clear laminate. 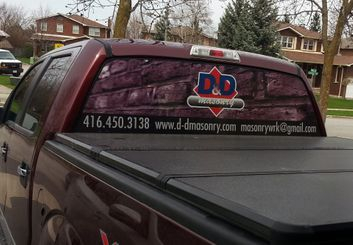 Perforated window graphics allow great visibility from inside the vehicle and allow you to advertise your business wherever your vehicle happens to be 24/7 or just add a touch of individuality to any vehicle. This is also a great way to add visual appeal to your store front windows while still allowing light inside and a unobstructed view outside. Please feel free to contact us about pricing or any other questions you may have. 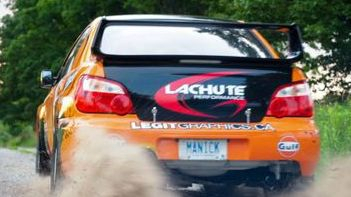 Team Manick came in with their rally prepared Subaru race car looking for a full colour change to orange and their sponsors graphics. Using 3M gloss orange wrap and 3M printable wrap vinyl, we achieved what is one of the best looking cars in the CRC series.